Hob: The Definitive Edition is an action-adventure game in the vein of the earlier Legend of Zelda games. Players explore a colorful world that on the surface is a beautiful natural landscape with elements of an ancient advanced civilization. However, lurking underneath is monstrous machinery that manipulates the landscape as players progress through the game. From the start there’s a sense of adventure and intrigue that will keep most players engaged until the very end. Hob is a story of healing and renewal. At the beginning of the game, players are introduced to the main character. No words are spoken throughout the entire game. Within the first few moments the main character meets a robot friend that assists him after his arm becomes infected by purple goo that has grown all over the land. In order to heal the arm, the robot replaces the main character’s with its own. This new bionic arm is used to activate runes and gains special abilities that are required to progress to new areas of the world. Chambers are littered throughout the land that will upgrade the arm with new features, like the ability to teleport and the addition of a grappling hook. By the end of the game you’ll have an entirely different move set at your disposal! Unlike the aforementioned Zelda games, here dungeons don’t yield new sub-weapons or abilities, but instead open up new locations in the world via large machinery that alters the land above. Hob’s versions of treasure chests are square columns with a hand symbol on them. The main character touches the hand symbol with his robot arm, and it opens. Some chests contain money, others offer up blueprints for arm upgrades. I touched on this earlier, but one of the coolest parts of the game revolves around physically changing the landscape. Finding devices will shift entire pieces of earth up or down, transforming the world around you. It appears as though you might be restoring the terrain to the way it was originally and indeed, as the story progresses it becomes rather obvious that something happened a long time ago. Unraveling this mystery as well as marveling at the ever-shifting landscape is half the fun. Environments are beautiful, ranging from serene landscapes to lightning-filled deserts. There are even spots in the world where the hero can sit down and look out over the world below and it’s quite breathtaking. Music is used sparingly, allowing the sounds of nature to fill in the void. When the music does kick in it’s composed very well and you know something big is about to happen, like the shifting of the land. Combat is fun and accurate. The hero starts out with a sword and can slash and dodge at the start of the adventure. It won’t take long before new abilities are discovered or purchased. These are wide and varied and include things like using your mechanical arm as a shield or to punch an enemy to knock off its armor. Using these arm abilities takes energy that recharges over a short period of time. As you gain new combat skills you’ll come across enemies that can only be defeated by using these powers effectively. New swords can also be forged by finding old ones from fallen heroes. Power cells from robot parts and plant pods are hidden about the world. These will allow you to upgrade your special energy and health respectively. Much like Super Metroid, players have access to a map of the overworld. It greatly helps navigating the environments and is very easy to read. As you discover chests, power-ups, and upgrades they are all automatically marked on the map. This makes it much easier to go back and remember to pick them up later on when you can access them. Even though your next objective is clearly marked on the map, many times it’s an area that hasn’t been fully explored, so the map hasn’t filled in the rooms yet. The game doesn’t require the player to backtrack too much, although you can if you want to be a completionist and collect everything. Although I had a fantastic time playing through the game, there are a few sticking points. I did run into a scenic spot that if activated a second time, I got stuck. I ended up having to close and reload the game. The biggest issue with the game concerns camera problems. For the majority of the game the camera view is from above and always facing the same direction. However, in several areas of the game the camera flips around when walking through small doors or holes, and this abrupt switch can be very disorientating. In one instance the camera changed perspective too soon and I wasn’t able to see anything but a wall. Of course this happened at the most inopportune time where I was trying to navigate around some poisonous purple goo that could have easily killed me. The other issue with the camera is that sometimes it will pan out to give a wider view of the terrain. When this happens the game often slows down to a crawl and the frame rate takes a huge hit, which is unfortunate to see for an otherwise polished game. Despite some graphical hiccups, Hob: The Definitive Edition is an excellent game. The glitches and technical issues didn’t ruin any enjoyment I had. If you enjoy the classic Zelda games and like character progression without the need for a ton of cinema scenes or annoying dialog, then this game is a must-buy! So many developers try to ape the Zelda formula and most fail. 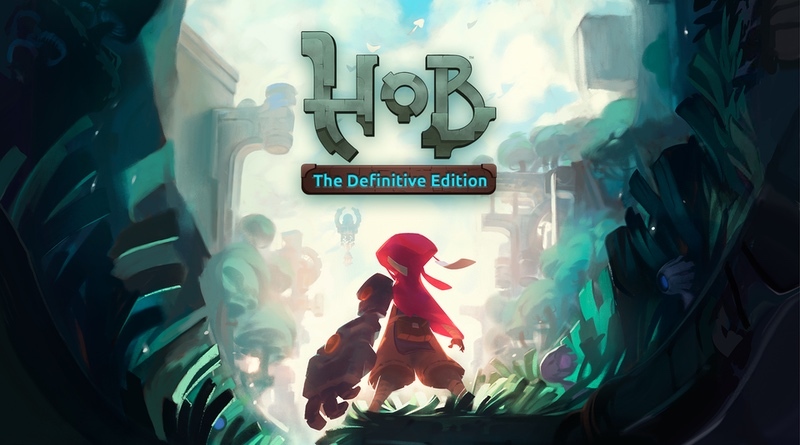 Hob: The Definitive Edition is one of the few that succeeds and delivers a fun and entertaining action/adventure experience that is both unique and exciting. A few performance issues can’t hold back an otherwise excellent game that belongs on your Switch home screen. Chris is an avid fan of video games as well as board games. He has a special place in his heart for JRPGs and enjoys listening to quality game soundtracks!